The interactive logon process is the first step in user authentication and authorization. Interactive logon is mandatory in the Windows Server 2003, Windows XP, Microsoft Windows 2000, and Windows NT 4.0 operating systems. Interactive logon provides a way to identify authorized users and determine whether they are allowed to log on and access the system. This section describes the interactive logon architecture, the process of an interactive logon, and the way in which the Windows Server 2003 interactive logon process locks the workstation and helps to keep it secure. For more information about these components, see Interactive Logon Components later in this section. Windows Server 2003 interactive logons begin with the user pressing CTRL+ALT+DEL to initiate the logon process. The CTRL+ALT+DEL keystroke is called a secure attention sequence (SAS); Winlogon registers this sequence during the boot process to keep other programs and processes from using it. The GINA DLL generates the logon dialog box. The following figure shows the Windows Server 2003 logon dialog box. A user who logs on to a computer using either a local or domain account must enter a user name and password, which form the user's credentials and are used to verify the user's identity. For smart card logons, a user's credentials are contained on the card's security chip, which is read by an external device, a smart card reader. During a smart card logon, a user enters a personal identification number (PIN) instead of a user name, domain, and password. Local logons give users access to local computer applications and resources but not to domain applications and resources. When users log on locally, their identities are validated by authentication packages to local account information stored in the Security Accounts Manager (SAM) database. The SAM operates in the security context of the LSA; it protects and manages user and group information in the form of security accounts stored in the local computer registry. Because user accounts are stored on the local computer, network access is not required for local logons. However, if a computer has a network connection and a user logs on to a local account, there is no interaction with the network. Local logons can be performed on Windows client operating systems, such as Windows XP and Windows 2000 Professional. Windows server operating systems, such as Windows NT Server, Windows 2000 Server, and Windows Server 2003, also permit local logons. The following figure shows the local logon architecture. A successful local logon begins when a user presses CTRL+ALT+DEL. Winlogon and the GINA DLL collect the user's credentials and then send the credentials to the LSA. The LSA verifies the user's identity and then returns a logon success and the user's access token to Winlogon and the GINA DLL. Winlogon and the GINA DLL then activate the user's shell by creating a new process, such as Explorer.exe. Domain logons give users access to resources throughout the domain. Domain user accounts are stored in an Active Directory domain. Active Directory is deployed on each domain controller, and domain user accounts are replicated throughout a domain. Before a user can log on to a computer by using a domain account, the computer must be joined to a domain. If the computer has access to a network connection, the user can log on to a domain if the user has an account in the domain's Active Directory. The computer must transparently authenticate to the domain's Active Directory. This form of logon is called a computer logon. Both users and computers are considered equal security principals in Active Directory; to be granted access to network resources, both must be able to verify their identities. Users can use a domain account to log on to Windows client operating systems, such as Windows 8. Windows server operating systems, such as Windows Server 2012 R2, also permit domain logons. Only server operating systems can function as domain controllers and deploy Active Directory. On a domain-joined computer, Windows is hard-coded to show only the last logged on user or Other user. Additional tiles for other users to log on are available only for computers joined to a workgroup. The following figure shows the domain logon architecture. Unlike a local logon in which the local LSA validates the user, during a domain logon, the LSA on a domain controller validates the user. The LSA evaluates the user's credentials to determine if the logon should be processed as a logon to a local account or a logon to a domain account. After determining the logon type, either the NTLM or Kerberos authentication package validates the user. If the authenticating domain controller is a computer running Windows 2000 or Windows Server 2003, the LSA will use Kerberos, the default authentication package for domain and network logons. The LSA uses NTLM to process domain logons in Windows NT 4.0 mixed environments. Single sign-on (SSO) uses credentials collected during an interactive domain logon to allow the user to authenticate to a network one time and, thereafter, to have access to all authorized network resources without additional authentication. The network resources can range from hardware devices, such as printers, to applications, files, and other types of data, all of which may be located throughout an enterprise on servers of various types, possibly in different domains and running different operating systems. The components of the interactive logon process are responsible for helping to establish secure user authentication. This section describes the roles and functions of the user logon components. Winlogon (%windir%\System32\Winlogon.exe) is the executable file responsible for managing secure user interactions. Winlogon initiates the logon process for Windows Server 2003, Windows 2000, Windows XP, and Windows NT 4.0. Winlogon is responsible for the following tasks. Winlogon helps prevent unauthorized users from gaining access to system resources by locking the computer desktop. 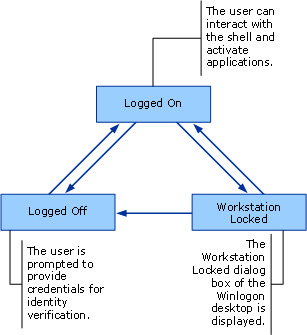 At any time, Winlogon is in one of three possible states: logged on, logged off, or workstation locked, as shown in the following figure. Winlogon switches between three desktops—Winlogon, screen saver, and default—depending on its state and user activity. The following table lists and describes each of these desktops. Winlogon Also called the secure desktop. There are five dialog boxes in the Winlogon desktop, which are described in the following table. Screen saver Used when a screen saver is running. Default Displayed when a user has successfully logged on to Windows Server 2003 and the user's shell has been activated. The user's applications run in this desktop. The following table lists and describes the five dialog boxes in the Winlogon desktop. Welcome to Windows Displayed when a computer has initially booted and no user has entered a SAS or when a user has logged off. Log On to Windows Displayed after a user presses CTRL+ALT+DEL when no user is currently logged on. - A logged-on user presses CTRL+ALT+DEL when the workstation is not locked. - When the workstation is not locked, after a user presses CTRL+ALT+DEL and clicks Change Password. Computer Locked Displayed when the workstation is locked either explicitly by the user or when a screen saver is set as secure and is dismissed. Unlock Computer Displayed when a user presses CTRL+ALT+DEL when the workstation is locked. By switching between the desktops for different logon tasks, Winlogon ensures that its processes will be invisible to applications not involved in the logon process, preventing logon data from being compromised. Winlogon registers the default SAS during the boot process, which ensures that no other program can access the same key sequence and compromise the logon process by impersonating Winlogon and its logon dialog boxes. When Winlogon recognizes a SAS event or the GINA delivers a SAS, Winlogon calls one of the SAS processing functions of the GINA. After a successful logon, Winlogon loads user profiles into the HKEY_CURRENT_USER registry key. Winlogon monitors keyboard and mouse activity to determine when to activate screen savers. When a screen saver that is set as secure is dismissed, Winlogon treats the workstation as locked and the GINA displays the Computer Locked dialog box. When a screen saver not set as secure is dismissed, the user is able to access the application desktop without being prompted to reenter credentials. If there are multiple network providers installed on a Windows-based system, they can be included in the authentication process and in password-updating operations. This inclusion lets additional network providers gather identification and authentication information during a logon, using the secure desktop. The GINA is a DLL module that operates in the security context of Winlogon. Winlogon loads the GINA early in the boot process. The GINA is responsible for processing SAS events and activating the user's shell. The GINA can generate SAS events in some instances. In Windows Server 2003, Windows XP, and Windows 2000, Msgina.dll (%windir%\System32\Msgina.dll) is the default GINA; it can be replaced to support specific and unique authentication methods. GINA customization is enabled to accommodate the use of authentication hardware tokens, such as retinal scanners and proprietary smart card solutions. The LSA (%windir%\System32\lsass.exe) is a protected security subsystem that helps create secure user interactions in Windows Server 2003. Winlogon and the GINA call the LSA to process logon credentials. - Packages to create a user's logon token after authentication. - Applications to call directly for user logon. - Microsoft Security Support Provider Interface (SSPI) requests and the routing of requests to the appropriate authentication package. - Applications to enumerate available authentication packages and query package capabilities. - Applications to resolve Security Identifier-to-Name and Name-to-Security Identifier. - Applications to store secret information in the system. Logon session state Manages the state of the logon session for any user authenticated by the authentication packages. Notification to installed authentication packages Notifies installed authentication packages of user logon, logoff, and credential updates. Authentication packages Loads and unloads authentication packages. Encryption assistance Includes subcomponents that provide encryption services to users of the local computer. The following figure shows the LSA architecture. 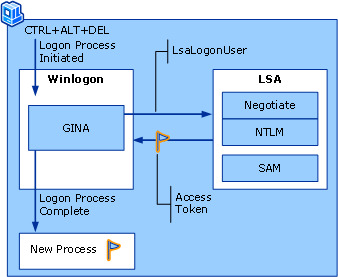 Winlogon, which runs as a separate process from lsass.exe, is shown here to illustrate the way in which the logon process interacts with the LSA. Some components shown in this figure run only on domain controllers or non-domain controllers. The SAM runs only on non-domain controllers and Windows NT computers; Directory Services runs only on domain controllers. As the figure shows, all calls from Winlogon are sent by using the Secur32.dll LsaLogonUser call. LsaLogonUser returns the call through local procedure call (LPC) to the LSA Server service. The LSA Server service then determines which authentication package to use to process the logon. You can set user rights for local computers by using the Local Security Policy snap-in of the Microsoft Management Console (MMC). On Windows Server 2003 non-domain controllers, the Group Policy User Rights Assignment contains information about which users are authorized to perform different tasks, including logging on to the system locally. Domain controllers use the Domain Security Policy snap-in of the MMC to set user rights for domain computers. The User Rights Assignment on domain controllers contains information that applies to the entire domain. Authentication packages on the user's local computer communicate with server authentication packages to authenticate users. Windows Server 2003 applies default authentication packages for user authentication and also supports custom authentication packages. The following table lists the Windows Server 2003 authentication packages used for interactive logons. The SAM stores information about local user accounts in the Windows registry. Passwords are encrypted by the NTLM authentication package. The outcome of the encryption is a hashed password transformed into ciphertext, a string of numbers and letters that appears meaningless. The hashing process occurs by means of a hashing algorithm. NTLM uses the same algorithm to encrypt and decrypt a user's password. Domain account information is stored in Active Directory on the domain controllers. Within a particular domain, each domain controller has an identical copy of the domain's Active Directory. Users can therefore authenticate to any domain controller and their logon information will be recognized throughout the domain. In network environments, authentication protocols are used to authenticate users, computers, and groups. For local logons, Windows Server 2003 supports the NTLM authentication protocol. For domain logons, Windows Server 2003 supports the Kerberos V5 and NTLM authentication protocols. Windows Server 2003 also supports custom authentication packages. Kerberos.dll - Kerberos V5 authentication package authentication protocol. - Standard Internet protocol and default network authentication protocol in Windows Server 2003. - Performs authentication of users and computers in Windows 2000, Windows XP, and Windows Server 2003. MSV1_0.dll - NTLM authentication package authentication protocol. - Default network authentication protocol in Windows NT 4.0. - Performs authentication of users and computers in Windows NT 4.0 mixed environments. - Included in Windows Server 2003 for compatibility with Windows NT 4.0 mixed environments. For more information about how the Kerberos V5 protocol implements user authentication, see Kerberos Authentication Technical Reference. This section describes the events that occur during an interactive logon. The following figure shows the local logon process. 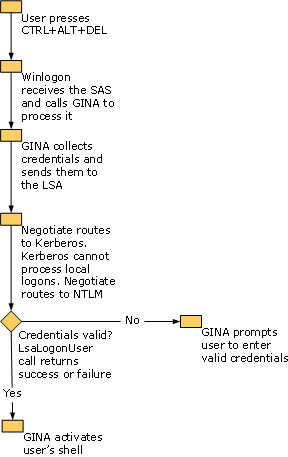 The GINA specifies the Negotiate authentication package when it calls into the LSA. Negotiate must then choose an authentication package to process the logon. Negotiate sends the credentials to Kerberos, the default authentication package beginning with Windows Server 2003. However, the Kerberos authentication package cannot process local logons, so it returns an error to Negotiate. Negotiate then calls NTLM to authenticate the user by comparing the received credentials with those hashed in the SAM. If the credentials are valid, the LSA generates an access token for the user based upon user rights assigned to the user's account and LsaLogonUser returns the logon success and the user's access token to Winlogon and the GINA. The GINA then activates the user's shell and Winlogon switches to the default desktop. If the credentials are invalid, the LSA returns a logon failure, the GINA displays an error message and prompts the user to present valid credentials, and Winlogon remains in the Winlogon desktop. Domain logons can only be performed from computers that are joined to a domain. Domain credentials consist of a user's domain account user name, password, and the name of the domain. The local computer's LSA chooses the appropriate authentication package to use based on the domain's environment. The following figure shows the process that occurs when the local computer can reach a domain controller to authenticate the user. If a domain controller is not available, a cached logon occurs. As with the local logon process, the Negotiate authentication package routes the authentication request to the default authentication package, Kerberos. The domain client chooses Kerberos, and Kerberos validates the user's credentials by contacting the domain controller. The LSA on the domain controller returns the logon success or failure to the local computer's LSA. 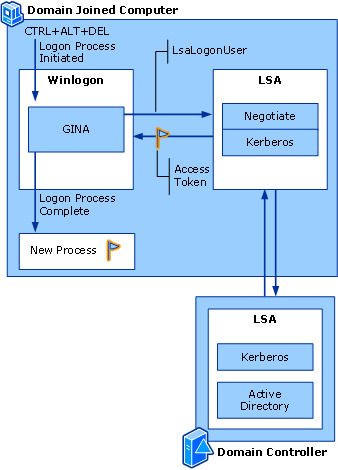 If the domain logon succeeds, the local LSA generates an access token for the user based upon user rights assigned to the user's account, and LsaLogonUser returns the logon success and the user's access token to Winlogon and the GINA. The GINA then activates the user's shell, and Winlogon switches to the default desktop. If the credentials are invalid, the LSA returns a logon failure, the GINA displays an error message and prompts the user to present valid credentials, and Winlogon remains in the Winlogon desktop. In Windows NT 4.0 mixed environments, the NTLM authentication package validates the user's credentials by contacting the domain controller. Windows NT 4.0 stores user accounts in the SAM. Windows Server 2003 can be configured to support smart card logons. All smart card logons are processed by the Kerberos authentication package. During a smart card logon, the local computer checks to ensure the user's PIN is valid. The domain controller then authenticates the user based on the user's credentials in the smart card. Windows Server 2003 supports cached logons. The cached credentials of the last 10 users who have successfully logged on to a domain account can be used to log a user on locally if the authenticating domain controller becomes unavailable. Because the logon process can be deployed across various network boundaries, it can span one or more firewalls. The following table lists the three main configurable ports used by interactive logon. You can use the Registry Editor to modify the registry to apply fixed ports for NTLM and the LSA.